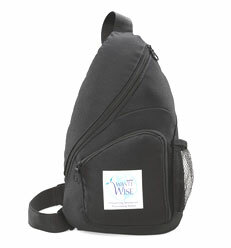 A marriage of style and ecological smarts, this modern sling pack helps protect the environment and looks good while doing it Side mesh water bottle pocket (bottle not Included) Front zippered pocket Adjustable shoulder strap. (1) Front pocket center 3.0" dia. (2) Back panel center 4.5" dia. IMPRINT CHARGES: Price includes 1 location / 1 colour imprint. Additional location/color $66 set-up and $0.50 running charge each per location.